E. This band is 7.5mm wide at top tapering to 5mm at back. The vine is four strands forged and woven with a .60ct. 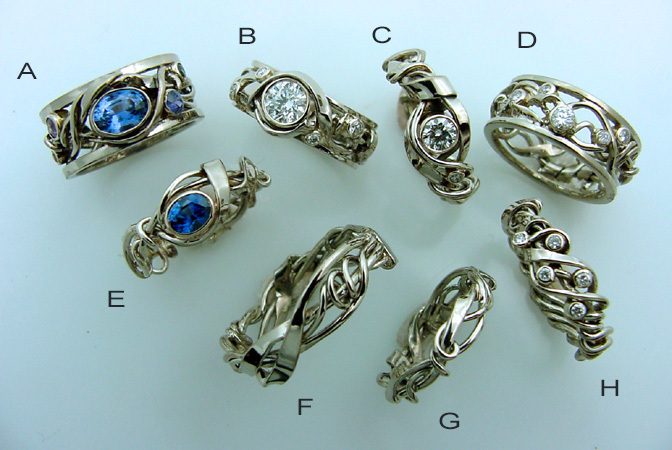 oval bezel set Sapphire; AAA Fine. H. This band is 7mm at the top tapering to 3.5mm at back. Five 1.5mm round brilliant bezel set Diamonds (.12ct.s total weight) are inset in weave across the top.